Often when I meet people, they ask me what I do. The challenge is, there is no easy answer to that question. I advise companies and non-profits on strategy, I do advocacy work and serve as an expert on open-innovation, open government and open data, I also work a negotiation consultant and mediator, I do some work with open source communities around community management, and then there are about another dozen projects and boards that I sit on. In reality, my work actually does tie together quite nicely, just not in a “this is my job title” kind of way. I also feel bad about the confusion. It doesn’t feel polite to take 5-10 minutes to explain one’s career and frankly, from a business development perspective, it isn’t very savvy. It’s part of the reason why I created the venn diagram at the bottom of this page. So people could see how my the different parts of my work relate to one another (or at least how I think they relate to one another – and yes, I should update it). 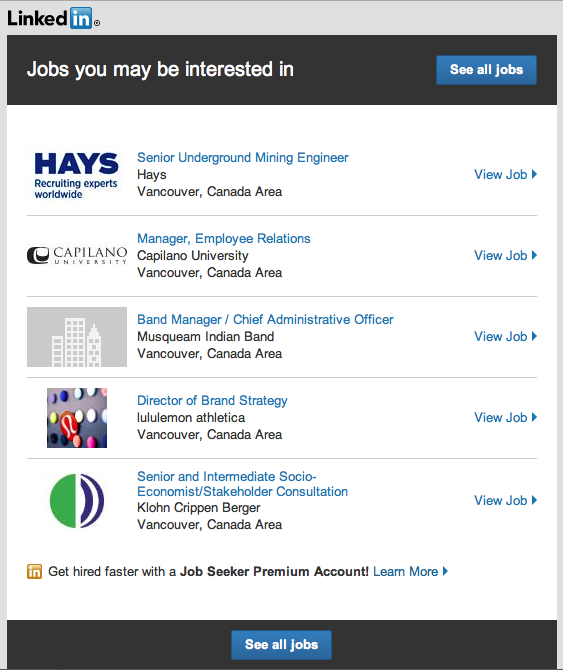 So it was somewhat fun to get this email from LinkedIn about jobs I may be interested in. I appear to have them vexed, or at least confused. I mean check out these jobs! What a mix! If only I WERE qualified for all of them. The coolest one, by far, is the Chief Administration Officer for the Musqueam Nation. But I’m definitely scrambling LinkedIn’s algorithms. Will be interesting to see if/how they evolve to produce results that likely make more sense. This entry was posted in random on May 1, 2013 by David Eaves.